A statement from the antigraft agency says they were arrested on Friday, February 1, 2019 in a sting operation. 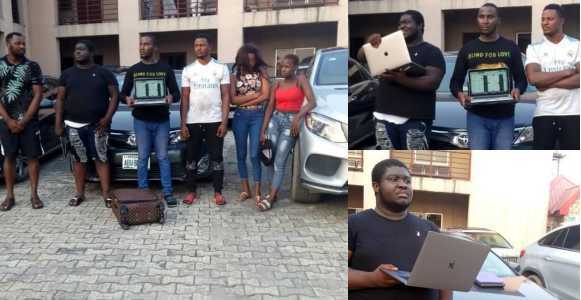 The suspects, comprising four men and two ladies are: Oghenekewe Innocent Akinnawo, Kemka Godseat Amadi, Revelation Macaulay, Damilola Adedoyin Oyinloye, Mary Ndubuisi and Jennifer Vandi. Several items were recovered from them at the point of arrest. Some of them are three exotic cars: Benz- E350-4Matic; Toyota Camry XLE and Benz- GLE 450. Others are four iPhones, four laptops; one iPad, one iron sealed stamp; cheque books, and car number plates.